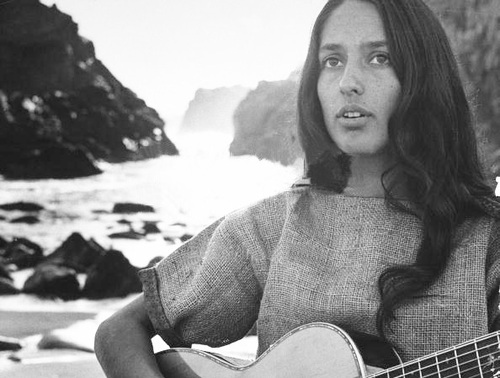 Today is Their Birthday-Musicians: January 9: Folk singer Joan Baez, "Diamonds and Rust," "The Night They Drove ol' Dixie Down," is 73-years-old today. January 9: Folk singer Joan Baez, "Diamonds and Rust," "The Night They Drove ol' Dixie Down," is 73-years-old today. 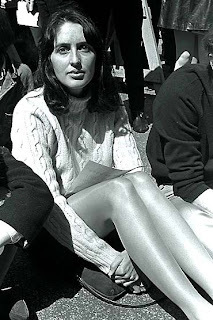 Joan Chandos Baez was born on Staten Island, New York in 1941. A friend of Joan's father gave her a ukulele and she quickly learned four chords. When she was 8, , Baez attended a concert by folk musician Pete Seeger, and was attracted to his music. She soon began practicing his songs and performing them publicly. One of her very earliest public performances was at a retreat in Saratoga, California, for a youth group from Temple Beth Jacob, a Redwood City, California, congregation. In 1957, Baez bought her first Gibson acoustic guitar. In 1958, her father accepted a faculty position at MIT, and moved his family to Belmont, a suburb of Boston, Massachusetts. At that time, it was within the center of the up-and-coming folk-music scene, and Baez began busking near home in Boston and nearby Cambridge. She also performed in clubs, and attended Boston University for about six weeks. In 1958, at the Club 47 in Cambridge, she gave her first concert. Joan has performed for over 50 years, released over 30 albums and recorded songs in at least eight languages, although she is only fluent in Spanish and English. She is regarded as a folk singer, although her music has diversified since the 1960s, encompassing everything from folk rock and pop to country and gospel music. 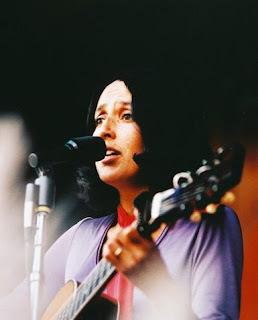 Although a songwriter herself, Baez is generally regarded as an interpreter of other people's work, having recorded songs by The Allman Brothers Band, The Beatles, Jackson Browne, Bob Dylan, Woody Guthrie, The Rolling Stones, Pete Seeger, Paul Simon, Stevie Wonder and many others. In recent years, she has found success interpreting songs of modern songwriters such as Ryan Adams, Steve Earle and Natalie Merchant. Baez has a distinctive vocal style. Her recordings include many topical songs and material dealing with social issues. Baez began her career performing in coffeehouses in the Boston-Cambridge area, and rose to fame as an unbilled performer at the 1959 Newport Folk Festival. She began her recording career in 1960, and achieved immediate success. Her first three albums, Joan Baez, Joan Baez, Vol. 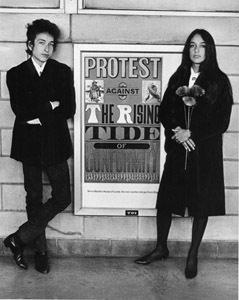 2, and Joan Baez in Concert all achieved gold record status, and stayed on the charts for two years. Baez had a popular hit song with "Diamonds & Rust" and hit covers of Phil Ochs's "There but for Fortune" and The Band's "The Night They Drove Old Dixie Down." 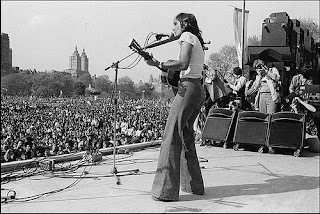 Other songs associated with Baez include "Farewell, Angelina," "Love Is Just a Four-Letter Word," "Joe Hill," "Sweet Sir Galahad" and "We Shall Overcome." She performed three of the songs at the 1969 Woodstock Festival, and helped to bring the songs of Bob Dylan to national prominence. She has had a lifelong commitment to political and social activism in the fields of nonviolence, civil rights, human rights and the environment. On August 2, 2009, Baez played at the 50th Newport Folk Festival, which marked the 50th anniversary of her breakthrough performance at the first festival. 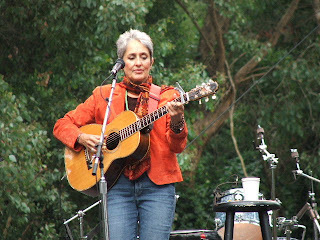 On October 14, 2009, PBS aired an episode of its documentary series, American Masters, entitled, Joan Baez: How Sweet the Sound. A DVD and CD of the sound track were released at the same time. Click to listen - or view- your favorite music and movies. said image and it will be promptly removed.